Formula 35*3595 The formula number on the label identifies the ingredients used to make that particular product. For competitive reasons, the supplier of this ingredient has asked us to keep the details confidential, and we're legally bound to do so. But we can tell you that it is a film former that we use in our products to create a coating or shine on the surface. This means that the surface has an added level of protection, and also has the shine that helps the surface look its best. Ethoxylated Alcohol is a cleaning agent, or "surfactant," that can also be found in household cleaning products like all-purpose cleaners and automobile cleaning products. We use it in our products to remove dirt and deposits by surrounding dirt particles to loosen them from the surface they are attached to, so they can be rinsed away. Ethoxylated alcohol can also be used as an emulisifier. It helps bind ingredients together and keep a formula from separating. Over time, it is possible for formulas in a product to separate. We add emulsifiers to our products where needed to ensure that our products provide the same performance use after use. Ammonium hydroxide is commonly referred to as "ammonia." 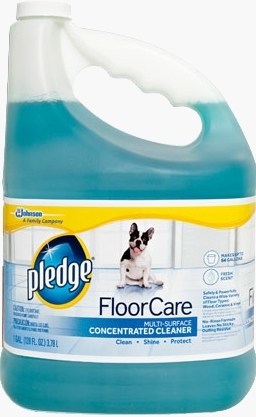 Many consumers use it at home for cleaning and laundry. It’s a cleaning agent, or "surfactant," that removes dirt, and it can also be used as a pH adjuster that alters the pH of a product to improve stability. Every formula has an optimum pH to make it work best. For example, a formula that’s more acidic works better for soap scum removal. Its opposite, a formula that’s more alkaline, might be more effective at removing grease or greasy soils. We use pH adjusters to make sure we achieve the best pH for a particular job. Also, the pH of a formula can affect how long it lasts within a container – for example limiting its tendency to corrode a can, container or dispenser. Household ammonia has a strong odor; by using ammonium hydroxide in combination with other ingredients, we can achieve the same cleaning results while using much less ammonia. Sodium C14-16 olefin sulfonate is a cleaning agent, or "surfactant," that can also be found in shampoos, shower products and cleaners. We use it in our products to remove dirt and deposits by surrounding dirt particles to loosen them from the surface they're attached to, so they can be rinsed away. Disodium ethanoldiglycinate is a chelator that can also be found in a variety of household products including cleaning, water treatment and personal care products. The word chelator (pronounced "key-lay-tor") comes from the Greek word chele, or claw. Think of a chelator as a tiny claw that reaches out and grabs the minerals in soap scum or soils, to keep them from depositing on a surface. We use disodium ethanoldiglycinate in products to remove soap scum and mineral deposits that are caused by hard water. By binding to the soap scum or deposit, it allows them to be rinsed away. 2-ethyl-2,5-dimethylhexanoic acid is a cleaning agent, or "surfactant," that we use in our products to remove dirt and deposits. It does this by surrounding dirt particles to loosen them from the surface they're attached to, so they can be rinsed away. Potassium hydroxide is a builder that can also be found in bath, cleansing, makeup and shampoo products. We use it to make a product formula clean better by affecting the molecules in the formula so they work together better. Potassium hydroxide can also be used as a pH adjuster within our products. As a pH adjuster, it helps alter the pH of a product to improve stability of the formula overtime. Dimethyl oxazolidine is a preservative. It helps maintain product quality and performance over time. Some people raise concerns about preservatives, because a small number of individuals have allergies to them just as some people have allergies to nuts or bees. But preservatives play a very important role in food, cosmetics and household products. Without preservatives, many products would not last more than a week or two before being contaminated by bacteria, mold or yeast. So, we feel the best choice is to add preservatives in the smallest effective quantity to protect our products, but to list these preservatives in our formulas so that those with allergies in the family can make informed choices. Pylaklor Liq. Turquoise Blue S-732 is a colorant, or dye. We add dyes to products for a variety of reasons including helping you see where you applied the product, when a product is used up, or for aesthetic reasons. Pylaklor Liq. Turquoise Blue S-732 is a product of Pylam Products, Inc., which is responsible for its contents.